A few weeks ago an Enzie customer came in to out new factory to discuss is stairs. Being ever so proud of our new factory set up William invited the customer out into the factory to watch his (the customers) own treads being cut on the computerised CNC machine. Needless to say said customer was blown away. Wow, I thought that my stair was going to come in parts, shipped in from China! Was the customer’s reaction, I had no idea that you designed and made everything here in Australia, he continued. These (the customers) comments were the inspiration for this article on how we design and construct our products – right here Australia. With over 45 years in the spiral stair construction business, we know our ‘stuff’. Though out this time Enzie stairs has created the a process that strives to give our customers piece of mind from the design process, though the production of the stair, and until the stair case has been delivered and installed. But wait there is more, we also offer a life time guarantee on our product. This Guarantee is not just lip service, our proven longevity in the business shows that we have been and will be around to honour this guarantee. From the time you contact us for a quote, the design process begins. Understanding your needs, your price range and the purpose stair we set to work on designing the spiral stair case for you. So we can give you your all important quote. Once we have all the information on your staircase and you have ordered your staircase. Enzie set to work on creating a 3D CAD file on all the parts that will be made (in our Australian factory), specifically for your stair. This information is key, as it is from this 3D CAD file, that our computer operated Laser Machine and CNC machine makes and/or cuts out many of the parts for your stair. Having the ability to create this computer generated files also enables us to manage and store your stair information electronically so if we require this information in the future for any reason, we can access your file to re-produce any parts necessary. Enzie stairs have invested time, energy and money machinery and technology to improve the accuracy and quality of their product, over the years. And are always looking for ways to improve and evolve their product and service. It is with all the information produced at the design stage and from our 3D CAD computer generated paperwork that drawings and work orders are produced. 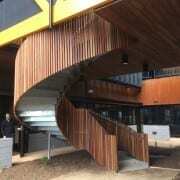 These work orders are then used in our Australian factory to create your spiral or helical staircase. As all Enzie Stairs are customised to suit your particular needs, we model your stair design in 3D for cutting, by our CNC computer controlled machinery. This enables cutting to an accuracy of 0.2mm. Having the ability to manufacture and produce stairs and stair parts gives our customers piece of mind that should something get damaged on their staircase in the future, Enzie stairs will be there to re-produce any parts necessary, to repair their staircase. The first Enzie Staircase was designed and by Bryan Mackenzie some 45 years ago. Wanting a Spiral Staircase and not being able to find one here in Australia Bryan Mackenzie set about designing a spiral staircase that suited his own needs. At this time Bryan also recognised that there was a gap in the Australian Stair market and Enzie Stairs was born. The Spiral Stair design that Bryan created is modular and self-supporting. This makes the staircase easy to transport, easy to install and if in the future you need to move it, it is easy to take down and re-assemble in another location. While our Enzie Spiral staircases are modular in design, each spiral stair case is custom made to order, to the customer specifications. Enzie Stairs and the different Handrail/Balustrade Options. As I am sure you already know Enzie Stairs currently offers four different designs in their spiral stair range. In this article I thought we would focus on the Handrail/Balustrade options offered with in each series. Most of Enzie’s stairs have a modular Handrail/Balustrade system. Made in our Australian Factory, our stairs are designed on site in a 3D CAD computer program and then custom made for each customer, according their individual stair needs. What is the difference between a handrail, balusters and balustrade? The ‘Handrail’ is the rail that you hold on to as you walk up or down stair. ‘Balusters’ are the uprights that sit under the handrail and support the handrail. While the ‘Balustrade’ is the barrier that prevents you from falling off the stair, and supports the handrail. The balustrade can take many forms, i.e a series of upright rods, a parapet wall, or a glass panelling. The design of both H and the H-S Handrail is very similar. The difference between the two being in the spacing between the steel upright Balusters. Note: There are also different Baluster designs available. The H- Balustrade has 3 balusters per tread paced up to 180mm, with a round handrail on top;. This spacing is larger than what you will find on most staircases. This spacing complies with the BCA regulations as outlined by our Certificate of Accreditation. This Accreditation is issued by the Building Control Commission, though is not deemed acceptable NSW and Qld. The H-S Balustrade has an extra baluster per tread, bringing the number of balusters per tread up to four again with a round handrail op top. This brings spacing of the balusters down to less than 125mm on the stair, which not only complies with the Building Control Commission it also complies with the ‘Deemed to Satisfy’ component of the BCA and is required in both NSW and QLD. Enfold Panels are the final Balustrade option offered in the Enzie Classic Spiral Stair series. 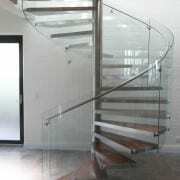 These enfold panels are offered in both glass and aluminium and they fully enclose the staircase and steps. The Enzie Spiral Stair series offers an amazing range of Balustrade options, with even further choices of materials and styles with in of the handrail options. Enclose Balustrade offers 3 different options. Option One – Solid Enclose. The sweeping lines of the stainless steel tubing, paired with a thicker handrail in either timber or stainless steel material leads the viewer’s eye up and around the staircase, enhancing any already elegant form. This Balustrade solution takes simple timber slats and turns them into an elegant privacy shield. This adjustable steel Handrail/balustrade option is currently only available for the 1300 and 1500 diameter Universal stair. This option does allow the buyer to spend a little less but still enjoy the universals stair series. The Universal Lucinda Handrail/Balustrade allows for a clear or coloured curved toughened glass to be matched with a timber or stainless handrail. The Z Tread Spiral Staircase comes with the Enclose Balustrade system. https://enzie.com.au/wp-content/uploads/2013/06/project_fortitude_valley-4.jpg 2120 1413 admin https://enzie.com.au/wp-content/uploads/2013/04/logo_enzie_100.png admin2019-04-15 19:46:372019-04-15 01:59:00Enzie Stairs and the different Handrail/Balustrade Options. ﻿The 6 Steps when Purchasing a Spiral Staircase from Enzie. So you are interested in purchasing a stair, feel free to contact us with all your questions. We love to talk stairs and we welcome every opportunity to do so . Whether it is just a general question or you are looking for specific information we are happy to answer all your the questions. The Design stage is an interactive one between our Enzie representative and you the customer. The idea is for you (the customer), to explore the different staircase options available for the diameter and layouts. Other considerations are the location of the stair and options such as balustrading, finishes, timber selection if appropriate and colour. Once the design has been decided upon, the Enzie representative will create a quotation of cost for your spiral staircase. 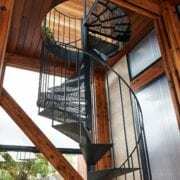 The quotation will list all of your Customer selections for your spiral staircase. If you the customer is unsure, it is possible to get a few different quotes on the different options you are interested in, to help you make a decision. At this stage a site visit may be arranged, though at this stage it is not always necessary and a quotation can be created from plans and drawings. When a site check is carried out the price of the stair may change slightly if the floor to floor height is not as listed on the quote. That there is sufficient space for the staircase to fit. Yes it is manufactured here in out Melbourne Factory. Before we start to manufacture your stair case, Sarah in the office will give you a call to see if you are ready to accept your stair. She will send you a copy of your invoice and may ask you to pay for your staircase. Because we believe in the “Just In Time Principles’ we do not like to make stairs that cannot be delivered to site once manufacturing is completed. Your stair case may be picked up or we can arrange for your staircase to be delivered onsite. Your staircase must be fully paid for before it will leaves our factory. https://enzie.com.au/wp-content/uploads/2017/07/161124-Dorman-House-0850.jpg 1920 1371 admin https://enzie.com.au/wp-content/uploads/2013/04/logo_enzie_100.png admin2019-02-25 21:41:582019-02-20 21:42:50﻿The 6 Steps when Purchasing a Spiral Staircase from Enzie.